In this platformer your character can dash in mid air. It's sorta like a double jump, but if that second jump was the dash from Hyper Light Drifter. This mechanic can be used to get through the level, but it also can be used to hurt enemies and break certain boxes. Every time you dash you either need to land on the ground to recharge it, or bop/dash into an enemy. This means enemies are not only obstacles, but also serve as an extra boost. They can help you clear gaps too large for one single boost. hey it's me again from wayyyy in the future. I just wanted to say thank you guys so much for saying what you said. I was so afraid people weren't going to like my game. I'm glad I was wrong, hehe. Seriously though these comments made me feel so happy seriously thank you all so much love ya! awwwww thanks!!! I'll definitely look at it! Thanks! I was hoping the last level would provide a sense of accomplishment after beating it. Which is why I made it so difficult. I probably should've expanded the height though hehe. I'm glad you enjoyed it! Great game! I agree with what others have said in the art style is very charming. Neat mechanic and kept me playing for quite a while. Congrats! Thank you all for the positive feedback! I feel happier than when Rocket Bird gets the feather! Got stuck at the level with the 3 enemies placed diagonally as well. The jump dash is a little finicky at the moment, think its just adjusting the gravity and jump arc until it feels right, otherwise its a cute entry and loving the dash mechanic! This game is really great! It feels awesome to play an the art style is purely amazing! I really hope you'll continue to work on this game after the jam is done! thank you so much! I'm glad you like the art style I was worried it would come across as sloppy or lazy! Good thing people seem to think otherwise! Lots of fun! It reminds me of the dash from hollow knight - especially the parts when enemies are walking over spikes and you're hopping on top of them. 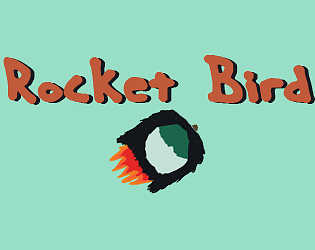 I think the game's strongest when rocket bird is airborne - really like hitting multiple enemies in one dash to clear big distances. I'm imagining large airborne areas where you have to follow a long path of enemies without ever touching the floor. Then maybe adding a combo system like... every extra dash you make without touching the floor makes the dash longer or faster. You could even have levels where you have to combo chain a bunch of enemies until you build up enough power to launch yourself over a large empty gap. Could defo do with some kind of rocket-ready indicator. Maybe just some visual cue from rocket bird when he's ready to boost. yeah I wanted to implement a combo system but I had no idea how. I'm unfortunately still pretty new to this whole programming thing. I wanted to make a couple of levels that were these long chains of enemies but I didn't want to overwhelm the players. Thank you so much for the feedback! I'm so glad people are enjoying this game! thank you so freaking much hearing this absolutely makes my day! The game was really fun! love how drastic the rocket is, and the mechanic that you get to rocket again after going through an enemy was really fun! I liked the level where you dash through the enemies one after the other. I actually got stuck on the level with three diagonal enemies and the exit is surrounded by a wall. I wasn't sure what to do! I also think it would be nice to have something that showed if your rocket was charged or not. yeah I thought about adding some sort of indicator to let players know if they can use he Rocket. Not sure why I didn't add one, guess I wa s just too lazy. So on that level you're stuck on you have to fall off the cliff a little before the part with the three enemies and then dash into them, then wait a little bit after you bash through the wall and then dash to the exit. I hope that helps. Honestly that level is a little finicky and it's more of a problem with the level itself than with you so don't feel too bad if you can't get it right. Also thank you so much for the kind words and the feedback, you have no idea how happy this makes me!